The built-in infra-red lighting on our cameras (and all IR cameras) acts a bit like an invisible torch-beam, considerably brighter in the middle of the picture, and darker around the edges. This unit acts to supplement this, adding to the coverage of invisible light. 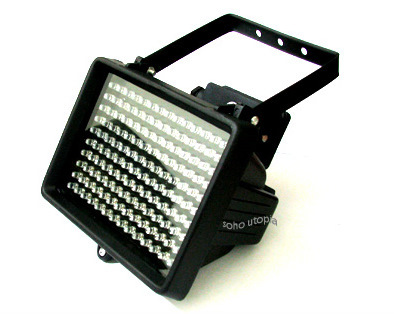 It has a range of about 40m and an angle of 30 degrees, making it perfect for stables, barns, farmyards and paddocks. It comes complete with a mains adaptor, generates virtually no heat and consumes only 18W of power. If you don`t want to leave bright lights on through the night in the area being monitored, this is the answer.